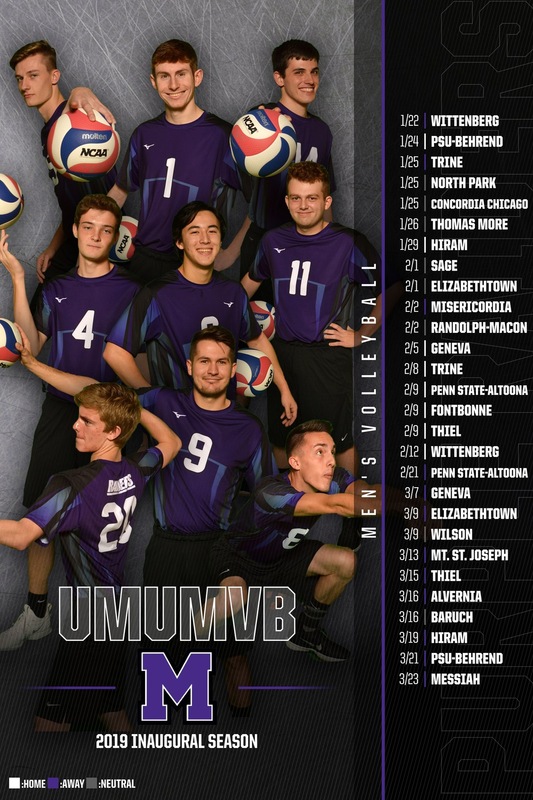 ALLIANCE, Ohio -- The Mount Union men's volleyball team fell in five sets to Geneva (Pa.), 3-2, Tuesday night at the McPherson Academic and Athletic Complex. Despite the loss, freshman opposite hitter Mark Bruns (Columbus/Upper Arlington) registered a season-high 24 kills to lead the Purple Raiders (4-8). Outside hitters Justin Sibbel (Stow/Stow-Munroe Falls) and Kaleb Krebs (Pittsburgh, Pa./Seton LaSalle) also recorded double digit kills in the match with 12 and 10, respectively. Bruns and Krebs additionally led the squad in service aces with two apiece. Krebs also found success at the net, as he recorded a team-high of five blocks; Sibbel and freshman middle hitter Sam Matonis (Macedonia/Walsh Jesuit) were right behind him with four each. Eight different Raiders collected digs, with four reaching double figures. Freshman libero Steven Grenier (Hawthron Woods, Ill./Lake Zurich) led the team with 16 digs followed by Bruns with 15, freshman setter Jeremy Leyden (Cuyahoga Falls/Archbishop Hoban) with 14 and Sibbel with 10. With the win, Geneva improves to 7-2 overall as they were led by Quinn McCracken's 18 kills. Geneva won the first set, 25-21, after leading by as much as eight points. Mount Union conducted a 3-0 run late in the set to get within three at 24-21 but Geneva ultimately got the final kill. The Raiders went on to win in back-to-back sets, 25-17 and 25-22. Krebs and Sibbel combined for six kills in the second set to lead the offense. After claiming their first lead at 4-3, the Raiders kept it for the remainder of the set and come away with the eight point win. In the third set, Mount Union opened with a 5-0 run before pushing its advantage to seven points at 15-8. Geneva began to chip away and cut the deficit to just a point at 18-17, but Bruns would land four kills in Mount Union's final seven points for the 25-22 win. Controlling the start of both the fourth and fifth set, Geneva turned to McCracken as he collected 12 of his 18 kills in the final two sets. Mount Union tied Geneva eight time throughout the fourth set, last at 20-20, before Geneva was able to edge past the Raiders at 25-23. Mount Union stayed knotted up with Geneva through 4-4 but started to pull away and take the lead at 13-10 before Geneva came storming back on a 9-4 run to claim the fifth set, 19-17. The Raiders will stay home for the weekend as they host the 2019 Purple Raider Rumble February 8-9. Matches begin Friday, February 8 at 6 p.m.